Thank you for visiting the website of Deerfield Beach Chiropractor Dr. Leo Minsky and The Health Center - a professional Deerfield Beach chiropractic clinic. In practice as well as online, Deerfield Beach Florida 33442 chiropractor Dr. Minsky strives for excellence through superior patient treatment, education and satisfaction. Our Structural, Neuologic, and Metabolic Therapy Program is a revolutionary new approach. This cutting edge therapy provides effective non-drug relief for many conditions. While most health care in the United States focuses on symptom relief, we are concerned about the functioning of your body. We are concerned about your neurological function, disturbances in your metabolism, your structural deviations, your lifestyle and environmental choices, and the level of inflammation in your body. In our office, the whole spectrum is covered and each patient is provided a personalized life-style based approach to healing. Dr. Minsky spends quality time with each patient finding answers to their complex health issues. We hope you enjoy the information within and share it with others. Again, thank you for visiting www.drminsky.com and remember to come back often. We use a comprehensive approach to fix the CAUSE of your problem. It is called Neuro Structural Metabolic Care or NSM for short. Each patient is treated neuologically, structurally, and metabolically. What is Neuro Structural Metabolic Care? It is a science-based, natural way to become healthy again. NSM is patient-centered medical healing at its best. Instead of looking at and treating health problems as isolated diseases, it treats individuals who may have bodily symptoms, imbalances and dysfunctions. 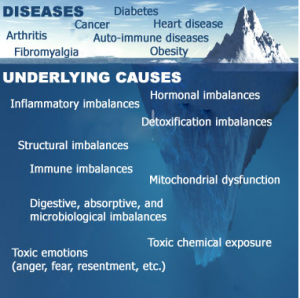 As the following graphic of an iceberg shows, a named disease such as PN., Thyroid, Digestive Dysfunction, Obesity, Diabetes, Cancer, or Fibromyalgia might be visible above the surface, but according to NSM the cause lies in the altered physiology below the surface. Almost always, the cause of the disease and its symptoms is an underlying dysfunction and/or an imbalance of bodily systems. Named diseases are just the tip of the iceberg. Below the surface are the real causes of a patients health problems. If health care treats just the tip of the iceberg, it rarely leads to long-term relief and vibrancy. Identifying and treating the underlying root cause or causes, as NSM has a much better chance to successfully resolve a patients health challenge. Using scientific principles, advanced diagnostic testing and treatments other than drugs or surgery NSM restores balance in the bodys primary physiological processes. The goal: restore lost function so the patients body can heal itself which equals=the patients lifelong optimal health. To battle chronic health conditions, NSM uses two scientifically grounded principles: 1. Add whats lacking in the body to nudge its physiology back to a state of optimal functioning. Plainly put, your body naturally wants to be healthy. But things needed by the body to function at its best might be missing, or something might be standing in the way of its best functioning. Functional Medicine first identifies the factors responsible for the malfunctioning. Then it deals with those factors in a way appropriate to the patients particular situation. NSM practitioners use advanced testing to identify the root cause or causes of the patients health problem. Old-fashioned diagnosis helps too, in the form of listening carefully to the patients history of symptoms and asking questions about his or her activities and lifestyle. For treatment, NSM practitioners use a combination of natural agents (supplements, herbs, nutraceuticals and homeopathics), nutritional and lifestyle changes, spiritual/emotional counseling, and structural postural corrections to remove nerve interference, if necessary to prod a patients physiology back to an optimal state. In addition, educating the patient about their condition empowers them to take charge of their own health, ultimately leading to greater success in treatment.